Analogue or digital, it does a great job at a bargain price. If you want 100 per cent genuine BBD analogue delay, you need to pay a whole packet more. Compact size; comprehensive range of analogue delay sounds. Four-screw battery access; slight treble lift when kicked in. BBD chip, analogue delay emulating pedals are getting better all the time. Joyo's take on the genre follows the familiar pattern with controls for delay time, repeat and mix. 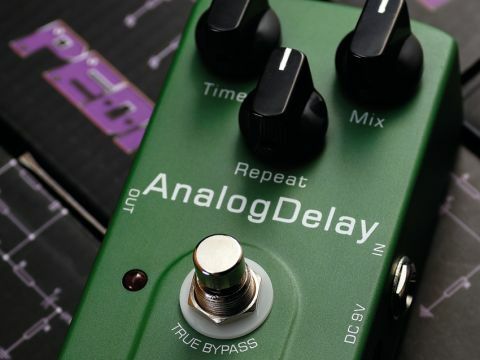 This pedal can do all the usual bathtub reverb, slapback and dub regeneration tricks and offers longish delay times too, which means that the shorter delays are concentrated in a small area of knob travel so specific delay times might be a bit fiddly to set up. The repeats break up naturally in the vintage fashion, but don't get as tonally dull for blending in as some analogue delays.